Coles will remove plastic wrapping from its bananas and other fresh produce as part of a wide-ranging series of commitments to reduce food waste, landfill and plastic packaging over the next four years. Announcing a what it called an “unprecedented” 10 commitments on packaging and recycling on Monday 4 June 2018, the supermarket said it would introduce new initiatives such as removing double plastic packaging for fruit and selling bunched vegetables like kale and silver beet without plastic. 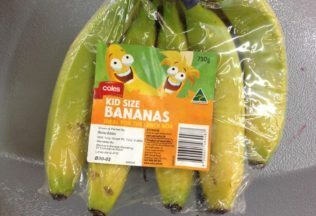 It comes amid growing calls for Coles, Woolworths and Aldi to cut down excessive packaging as photographs of individually wrapped bananas, sweet potatoes and cucumbers have sparked outrage on social media and condemnation from environmental groups in recent months. Coles also pledged to halve food waste across its supermarkets by 2020 and to make all packaging of Coles Brand products recyclable by the same year, five years ahead of the federal government’s timetable. By 2022, Coles said it would divert 90 per cent of all supermarket waste including food, cardboard and plastic away from landfills. It will also donate the equivalent of 100 million meals in surplus food to people in need by 2020. “We are delighted to be the only Australian supermarket to sell own brand water bottles that are both 100 per cent recyclable and 100 per cent made from recycled materials,” Mr Durkan said. “Now we are the first major food retailer in Australia to announce a target to make all of our own brand packaging recyclable by 2020, ahead of the federal government’s target of 2025. “By the end of this year we will also connect every Coles store to the vital food rescue program, SecondBite, meaning surplus edible food from every Coles supermarket will be redistributed to people in need. By connecting an additional 130 supermarkets to SecondBite this year, we will also be further diverting food waste from landfill,” he added.